Custom home builder Lawmar Contracting in the Comox Valley has welcomed many new homeowners to The Ridge. Their clients choose the Comox Valley because of the West Coast lifestyle, the friendly community, the amenities, the activities, the scenery and more. They also come from many different places, including Metro Vancouver, other parts of BC, Alberta, Ontario and of course, some Comox Valley residents have relocated to The Ridge. New roads have been built and the construction has begun on several new homes in Phase II at The Ridge. Crews from the selected preferred builders are out in force as the spring weather settles into the Comox Valley. Are you thinking of purchasing a new home in the Comox Valley? The Ridge is the perfect spot to build or buy your new home. It is one of the premium view spots in Courtenay, from which to enjoy year round views of the Beaufort Mountain Range, the Comox Glacier and Comox Bay and the mainland mountains. New home building is now underway in Phase II at The Ridge. Many homes are under construction and three of their premier home builders are busy. Lawmar Contracting, Brando Construction and one of their newest builders, Candor Developments all have new homes under construction. This new phase includes 43 single family lots with zoning to accommodate secondary suites. From all of us at The Ridge, we wish you a Happy New Year! Building Links has recently compiled the building permit and construction values for the Comox Valley and Campbell River areas for the third quarter of 2017. Building Links notes a trend in the increase in the construction of secondary suites and carriage homes. They reported an overall increase of 238 per cent. Building Links tracks this information when a separate building permit has been taken out for a secondary suite or carriage home. In many municipalities including Courtenay, Comox and Cumberland, specific zoning allows for the construction of a secondary suite in a single-family home without applying for a separate permit. Based on this information they estimate that the increase is actually more like 400 per cent in 2017 compared to 2016. This means, according to the building permits reported, that there have been approximately 100 secondary suites and or carriage homes built in the past year, compared with approximately 25 built in 2016. Due to the rising cost of individual lots, the cost of construction and the looming shortage of sub trades, more buyers are looking to subsidize the high cost of a new home by building a secondary suite or a carriage home. According to the Vancouver Island Real Estate Board (VIREB) report for September of 2017, the cost of purchasing a home in the Comox Valley and the Campbell River area has increased by 22 per cent over the same time period last year. There is a shortage of lots in both the Campbell River and the Comox Valley areas, and this is contributing to the extremely high cost of buying a new home. Many new subdivisions are being proposed in both areas, but it is taking, in some cases, years to get the subdivision approved by the various municipalities. According to the same report by VIREB in September, strong economic fundamentals are underpinning housing activity in British Columbia, particularly in the southern half of the province. The BC economy has expanded at above-trend growth for more than three years, with 2017 expected to be the fourth consecutive year of economic growth hitting three per cent or higher. The secret is out about Vancouver Island – its beautiful scenery, the welcoming communities and up to now, the reasonable cost of buying a home. The real estate scene is changing dramatically and quickly and more people are choosing Vancouver Island as their destination to retire or relocate. In my view, the price of real estate will continue to go up due to the demand to live in a piece of paradise, known as Vancouver Island. Clarice Coty is the editor of Building Links. find Building Links on Facebook. 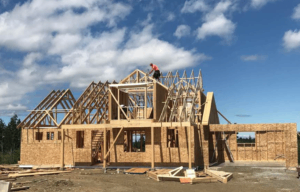 There has been a reported increase of 238% in the construction of secondary suites and carriage homes in many north-central Vancouver Island jurisdictions in the 3rd quarter. In many municipalities such as Courtenay, Comox, Cumberland and Campbell River specific zoning allows for the construction of a secondary suite in a single-family home without applying for a separate permit. Based on this information, we estimate that the increase of construction of secondary suites is actually more like 400% in 2017 compared to 2016. In conclusion, according to the building permits reported and our estimates, there has been a minimum of 100 secondary suites and or carriage homes built in the past year, compared with approximately 25 built in 2016 in the Campbell River and Comox Valley regions. The trend is growing thanks in part to new communities like The Ridge development in Courtenay, which is zoned to allow secondary suites or carriage homes on all of its Phase 2 lots. Overall single family home construction was up in all areas except for Comox, which reported a decline of -37%. The CVRD remained relatively stable, reporting a small decline of -5%. Overall, 309 permits for single family homes was up by 8% (24 new single family homes). Overall construction values were up by 11%, or $16 million over the same time period last year. There is a strong demand in all areas for new single family homes and we expect to see a gradual increase in construction as more lots are brought onto the market. Construction on new homes in Phase 2 of The Ridge will be underway this month. This phase consists of 43 lots, with some featuring stunning views of the ocean and of the surrounding mountains. The developers plan to add an additional 100 lots in the next phase, which will to come onto the market in the summer of 2018. All of these lots will include zoning for a secondary suite. The Ridge is a new sustainable residential community in South Courtenay and is a picture-perfect location for building a new home in the Comox Valley on Vancouver Island. Contact The Ridge to register as a “prospective client” for more information on their new residential lots for sale that will be available in 2018. Looking for map? Find one here.